Pressure cookers have gained great popularity in the contemporary kitchen because of their ability to cook fast. Unlike other cooking materials, a pressure cooker uses steam for best cooking results and the food cooks more evenly. Unlike stainless steel pressure cookers, an aluminum pressure cooker is lightweight and affordable. If you have discovered the benefits of owning a pressure cooker, it is equally important to know which one is best. It goes without saying that every person would like to have a good, durable and effective kitchen appliance that helps master the perfect meal. 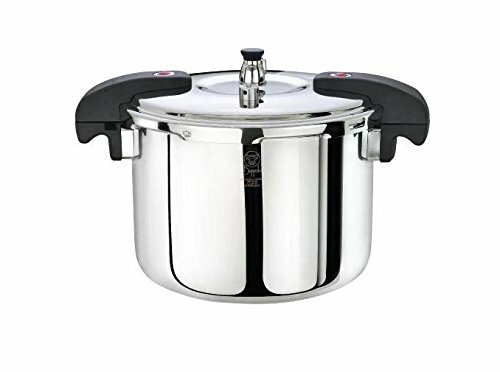 Having said that, there are many varieties of pressure cookers in the market today and it is important to do a good research before you put your money on the best aluminum pressure cooker. The A417-8080W is a remarkable stovetop pressure cooker from the reputable IMUSA team. 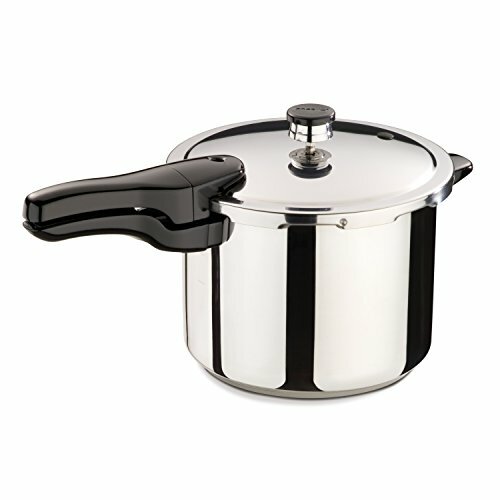 This pressure cooker is made of aluminum and has two cool-touch handles and two cool-touch spots on the lid. The cool touch handles and spot serve as an insulator against heat. This cooling feature ensures that the pressure cooker can be moved around and opened while it is hot. 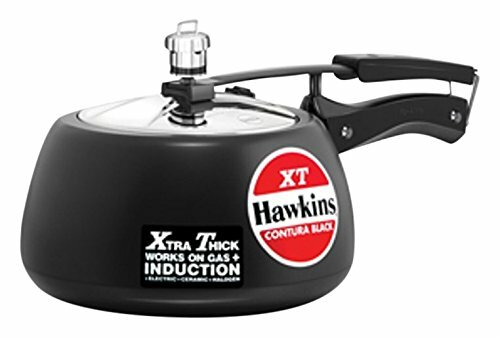 Additionally, this pressure cooker has a safety locking lid which allows for a quick build-up of pressure that ensures top cooking results within just a few minutes. Moreover, this pressure cooker is able to maintain the appropriate cooking pressure throughout the cooking process and delivers a well-prepared meal everytime. The safety locking lid does not only ensure that food is cooked promptly, it also reduces any kitchen hazards. 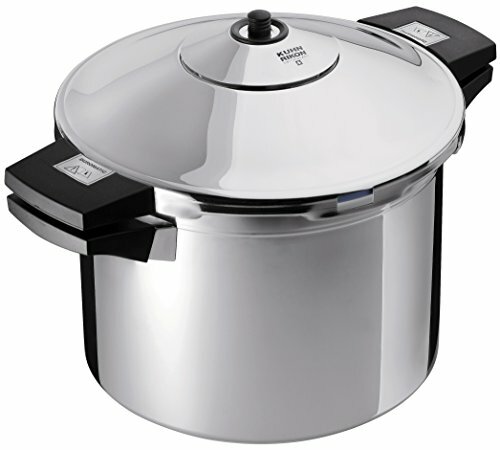 The Granite Ware cooker is an excellent pressure cooker that functions effectively as a canner and steamer as well. The product is made from heavy gauge, hard anodized aluminum which provides durability and also ensures rust-free experience, even after many years of usage. The pressure cooker comes with two cool-touch handles by the sides as well as two cool-touch spots on the lid. This unit features a 20-quart capacity which ensures large-scale canning as well as to provide a sizable cooking capacity for a large family. Additionally, this cooker meets the USDA safety standards for canning appliances and is therefore safe to use in your kitchen. Overall, this cooker/canner/steamer offers more than the price paid, because it provides three functions combined in one (canner, cooker, and steamer) which make this unit ideal for a large family. The Presto 012414 is an excellent pressure cooker that has been on the market for decades. This pressure cooker has a simple design that has not changed much over the years. It is made of heavy-gauge aluminum which not only ensures durability but also quick and even heating. Moreover, it has a single, long cool touch handle and a single cool touch spot on the lid. Additionally, it cooks three to ten times more than ordinary cooking methods. The lid is held in place by a simple locking mechanism that provides an excellent pressurized cooking environment. The pressure cooker has a steam release valve that is triggered in case the pressure starts building up to a dangerous level. The cooker maintains the proper cooking pressure automatically and comes with a cooking rack and a 64-page instruction/ recipe book. This All American is made of hand-cast aluminum with an attractive, easy to clean satin finish. The pressure cooker comes with a single cool touch handle on the lid. 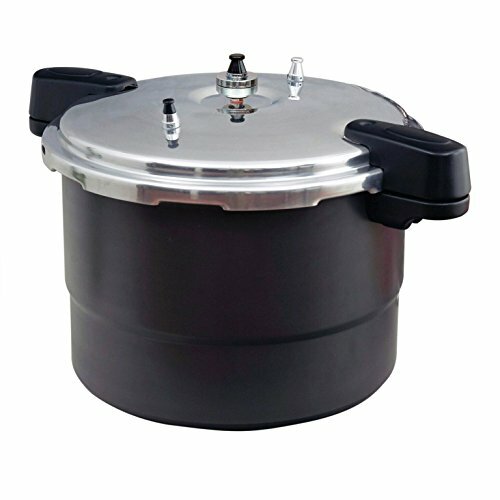 Additionally, the product is a large capacity cooker and canner and has the capacity to hold 7-quart jars. Moreover, it has an easy-to-read geared steam gauge and an automatic over-pressure release. 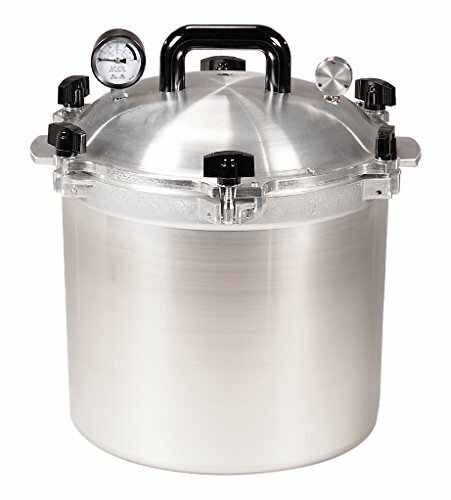 The product is unique for its steam gauge which makes it easy to know the temperature and the pressure level inside the pot at any particular period of time. Moreover, the cooker’s durable construction ensures that it lasts for many years to come. 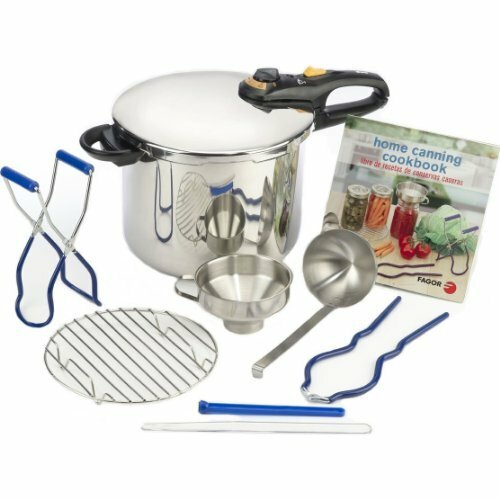 The clean satin finish makes it attractive and easy to clean and it enables you to combine the two processes of pressure cooking and canning. 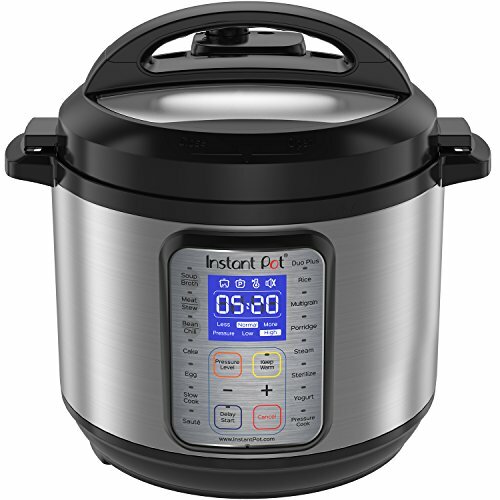 Overall, here is a great pressure cooker that has been receiving great reviews all over the Internet from happy customers that love its cooking ability and durability. 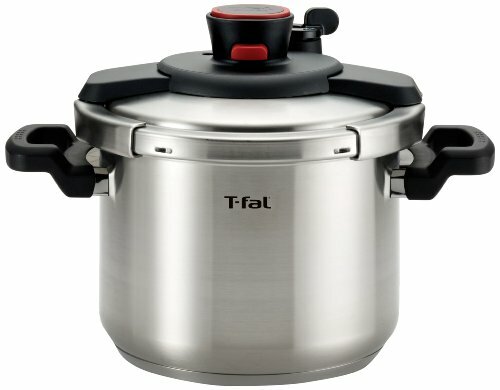 The T-Fal P31052 is not only a pressure cooker but also a canner that is made of durable polished aluminum. This unit has two cool-touch handles by the sides and one cool touch handle on the lid to ensure that you will never burn your hand when you move it or open the lid. The pressure cooker also comes with a deluxe pressure gauge dial and features a capacity of 22 quarts which is fairly large. Therefore, this unit is excellent for large families, as it can accommodate a lot of food. On top of that, the quality construction of the T-Fal makes it a long lasting appliance. This kitchen tool has a selective pressure control with three cooking pressure options and over-pressure steam-release safety components. The three cooking pressure options ensures that it can be efficiently used to cook a variety of foods. The steam-release components combined with the pressure gauge dial provide ample safety when using the appliance. The product comes with two canning rack and a sure-locking lid system. It also comes with a cooking rack and a recipe book. The Mirro 92122A is made of rustproof, heavy-gauge, polished aluminum and this pressure cooker/canner comes with two cool-touch handles by the sides. Additionally,this unit is excellent for large families because it comes in size of 22-quarts. TheMirro pressure cooker has a pressure control system which allows for 3 levels of operation. Therefore, this cooker is extremely useful for a versatile cooking experience.Also, it comes with remarkable safety features which include an over-pressure plug that is reusable. a sure-lock lid system and a side mounted gasket pressure release. The first thing that you would appreciate about the Mirro is its size and as we mentioned earlier, it is ideal cooker for large families. Despite being big, the aluminum construction makes it lightweight which again, makes it very easy to move around the kitchen. Its polished aluminum construction also ensures that it is easy to clean. Overall, here is a fantastic solution for large families and the Mirro is a top-rated pressure cooking that comes with a cooking rack and user guide which includes recipes. Our next pick is an advanced pressure cooker that is made of stainless steel. 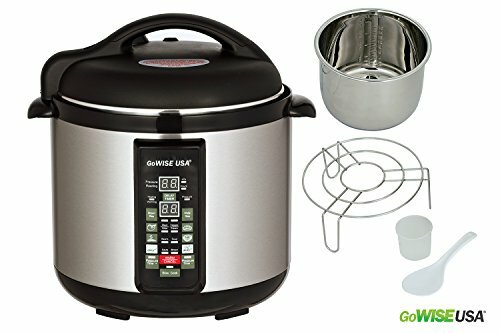 It is a 7-in 1 pressure cooker with 7 sophisticated pressure cooker functions which makes it very easy to prepare a variety of delicious foods. Moreover, this unit is unique for its super intuitive controls and also comes with a manual that gives detailed cooking recommendations for every cooking program. Aside from being a pressure cooker, it is also capable of performing some non-pressure cooking which includes, slow cooking, low heat cooking browning, and food warming. This Black and Decker is a highly recommended kitchen tool because of its variety of cooking features and several safety features which makes it very easy and safe to use. One of the most important factors to take into account before you buy an aluminum pressure cooker is its pressure regulator. The reason is that the pressure regulator ensures that the ideal pressure is maintained inside the pot. In other words, it helps to check and to control the internal pressure of the cooker. There are three types of pressure cookers regulators: a spring valve, modified weighted valve and weighted valve regulator. This is a very important feature to consider and all the major pressure cooker models have this feature. Every aluminum pressure cooker must have a lid-lock mechanism that automatically locks when there is sufficient pressure inside the cooker. When all the pressure is released and it is safe to open the cooker, the lid-lock mechanism allows you to safely open the top lid. This feature is very crucial as it affects the safety while using the cooker. When you’re purchasing an aluminum pressure cooker, always buy the one with a cooking rack built inside. This will make it easy to for you to cook different types of food separately. Sadly, many people ignore this feature but it is very important and you will be pleasantly surprised with the versatility that a cooking rack offers. As we discussed earlier, it is extremely handy to invest in a pressure cooker that maintains and controls the pressure with a pressure regulator. On the other hand, it is equally important to have a unit that features a pressure release mechanism. Therefore, before you buy a pressure cooker, ensure that it includes a pressure release knob. All that you’re required to do in order to release the steam is just releasing the cooker off the heat source and then use the pressure release knob. This knob will release the steam fast and safely and make it even safer to open the top covering lid. Of course, a pressure cooker is a kitchen appliance that should be very safe to use. When you’re buying it, you should buy the one that has strong and sturdy handles. A strong handle will make it easy and safe for you to handle the cooker when cleaning and serving. Moreover, ensure that the handles are ergonomically and perfectly designed for secure and easy gripping. Additionally, the handles must be made using material that is apoor conductor of heat in order to ensure that your hands are safe every time you’re holding the pressure cooker. 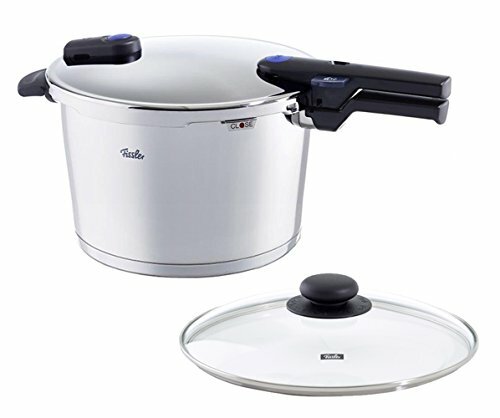 When you are buying an aluminum pressure cooker, buy the one that features a detachable cooking pot made of aluminum. It is very easy for you to wash a detachable cooking pot. Ensure that the pot is coated with nonstick Teflon to stop food from sticking to the sides. A manual and a recipe book will help you in using the pressure cooker. Of course, the manual must be written in an easy-to-read way. A recipe book will help you improve your cooking skills. Make sure that the pressure cooker has a manual and a recipe book. 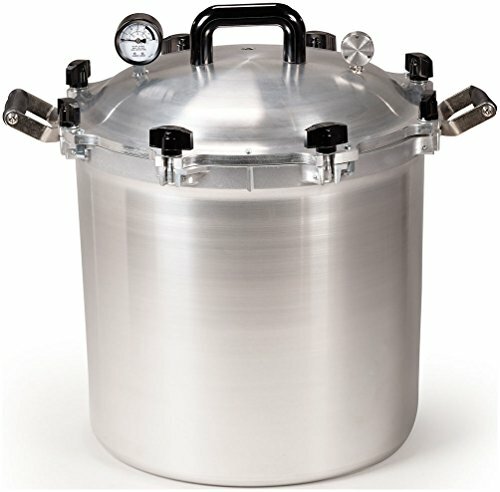 The capacity of an aluminum pressure cooker is a very important factor to consider. The capacity will depend on the size of your family or the amount of food you will be cooking using the pressure cooker. 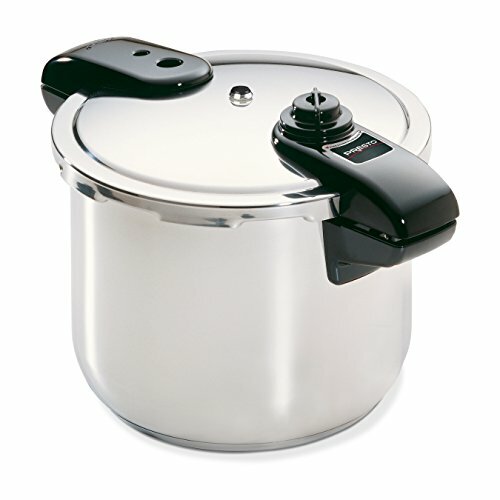 Aluminum pressure cookers come in different sizes; there are 4 quarts, 6 quarts, and 8 quarts and above. Therefore,you will be able to buy the one that is most appropriate. An aluminum pressure cooker is much better than a stainless pressure cooker. Aluminum material is lightweight, effective and very affordable. It is actually one of the most versatile materials. Most cookers love aluminum pressure cooker as it conducts heat evenly. Aluminum material is a fantastic thermal conductor which means that heat can easily and quickly spread. This means that you don’t have to wait for minutes for the material to heat up. Pressure cookers made using aluminum material are very strong and sturdy. Therefore, you don’t have to worry about anything when you’re buying an aluminum pressure cooker because it is safe, sturdy and effective. An aluminum pressure cooker is comparatively inexpensive. Most people can afford this type of pressure cooker. It offers a decent value for your money. An aluminum pressure cooker is affordable and highly convenient. 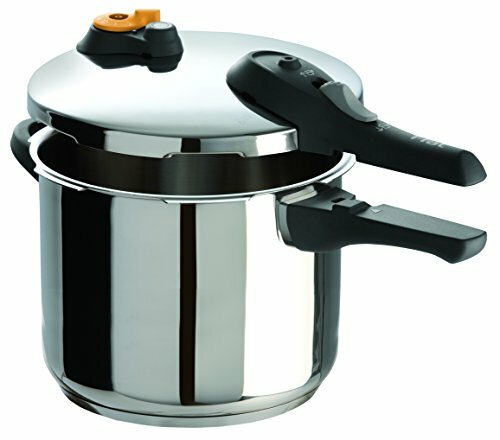 Unlike stainless steel, aluminum made pressure cooker is lightweight but very sturdy. This makes it easy to use. These pressure cookers have non-conductive handles that allow you to safely handle the pressure cooker when cooking and serving. Aluminum material is a good conductor of heat because aluminum heats-up faster and more evenly compared to stainless steel. This is actually one of the reasons why you should consider an aluminum pressure cooker. 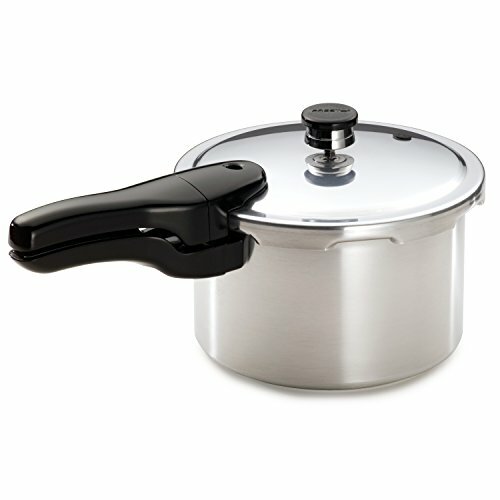 An aluminum pressure cooker is cost-effective because it spreads heat faster than stainless steel cooker. This means that the pressure cooker made of aluminum is cost-effective and energy efficient. After reading the guide above, you should be in a better position to select the best aluminum pressure cooker that fits your needs and cooking style. If you have not been using an aluminum pressure cooker, you need to consider using it as it has many advantages over other types of pressure cookers. Once you find the cooker that suits you the best, your cooking will be a lot easier, effective and less time-consuming. When you are buying a pressure cooker, you need to ensure that it meets all the tests and has all the necessary features in place. 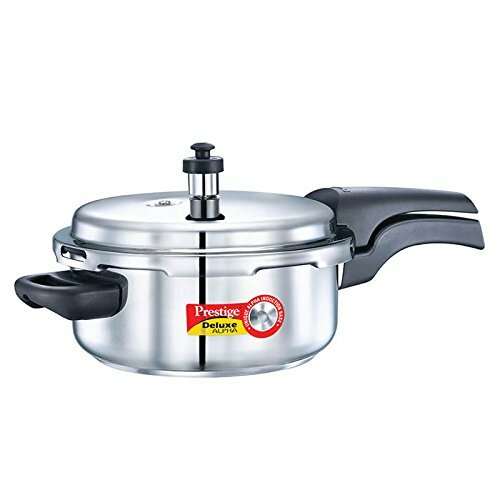 Aluminum pressure cookers are in terms of quality, ease of use, efficiency and affordability your best option when comes to pressure cooking appliances. Of course, they come in different sizes; you need to buy the ideal size depending on the size of your family. All the pressure cookers are reasonably priced and feature top-notch quality with long warranty.